Operation Pretty and Polished is an event that allows students to select free prom outfits. At the event, friends and I have altered some of the gowns for the girls and pants for the boys. I am reaching out to sewists in the Washington, DC area and asking if you can spare an hour or more and help with minor alterations at the event. Beginning sewing skills are fine! The minor alterations are shortening the length of the gowns by machine, taking in side seams, and hemming pants. If you can mark a hem, please help. If you can take stitches out, please help. If you can stitch a simple seam and can bring a portable sewing machine, please help. The Operation Pretty and Polished event is Saturday, April 20, 2013 from 9am – 3pm at the Boys and Girls Club of Greater Washington. Contact Julia Irving, the Community Outreach Coordinator Sixth District at the Metropolitan Police Department at 202-698-1315. I want to be at the Operation Pretty and Polished event, but I can’t. A promotion at work gave me a new role, and the new role is keeping me from this year’s event. I plan to be there next year, but more help is needed this year. Categories: Sewing | Tags: hems, prom dress, sewing for client | Permalink. While I like making pieces, I love making an ensemble. 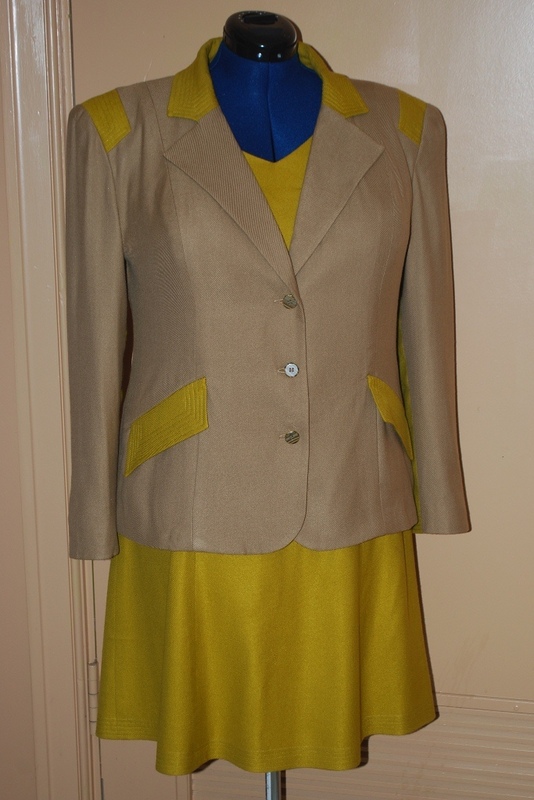 When I made the jacket to coordinate with the chartreuse dress, I realized how much I missed creating an outfit. 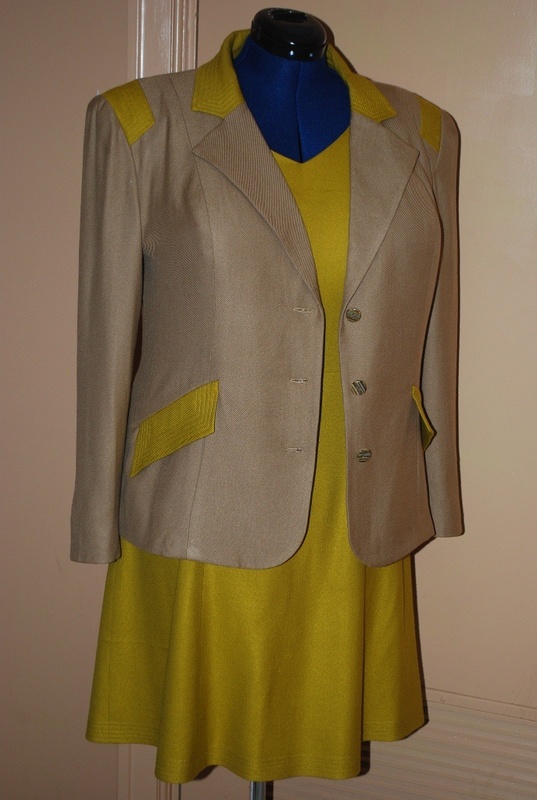 My first ensemble for 2013 is a coat, vest, slacks and blouse in the chartreuse and taupe color scheme. I’ve been working on the coat. The outer fabric is a chartreuse wool/mohair and the lining is rayon in a dark taupe color. I selected the buttons to coordinate with the brocade I am using for the vest. I splurged on everything as a treat to myself, purchasing the fabrics and buttons at Britex while I was in San Francisco in November for a business meeting. I am using Butterick 5685 with a few changes. I moved the pockets from the side seams to the front princess seams making it easier to reach into the pockets. I also deepened the pockets because I felt the pockets were too shallow and items may easily fall out. 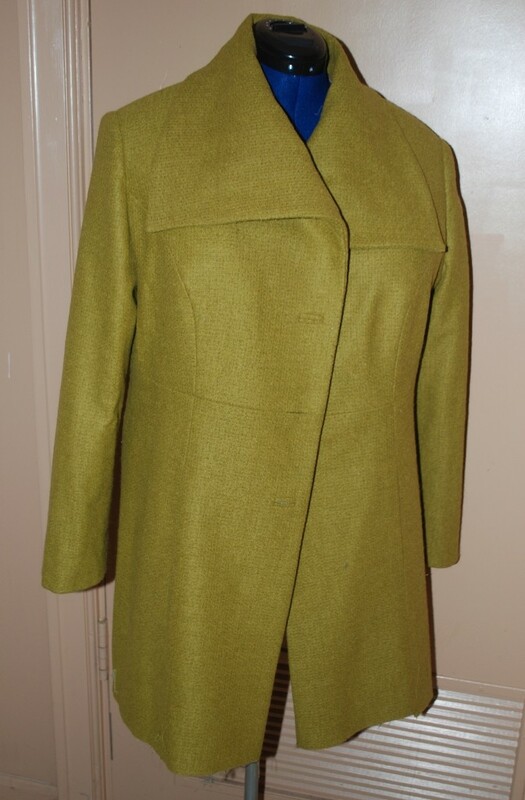 I didn’t want a double-breasted coat so I removed 2 ½” from the front edge of the coat including the collar edge. The sleeve is one piece with no ease for the elbow. Therefore, I lengthened only the back sleeve length ½” to allow for ease in the elbow area. I increased all hems to 2” because I think a generous hem hangs better. For a fleeting moment I thought about not doing a muslin fitting for the coat. I quickly decided not doing a muslin would be a bad idea considering how much I paid for the fabric. I would rather have a wadder in cheap cotton than one in expensive wool. I selected the size using my upper bust measurement and used the D cup pattern piece. Based on the fitting, the shoulder fit fine. I don’t like to feel confined so I added ½” at each side seam allowance, adding 1” overall to the sleeve width (bicep and wrist) and 2” overall in the bust and waist areas. I shortened the sleeve length which was too long. I made a sway back adjustment by shortening the back bodice ½” at the center back. I liked the “wrong” side of the fabric better because I thought the texture was more visually appealing for this ensemble. Before cutting out the coat pieces, I block-fused the wool fabric with weft interfacing to stabilize it. I also interlined the coat with cotton broadcloth for additional warmth. 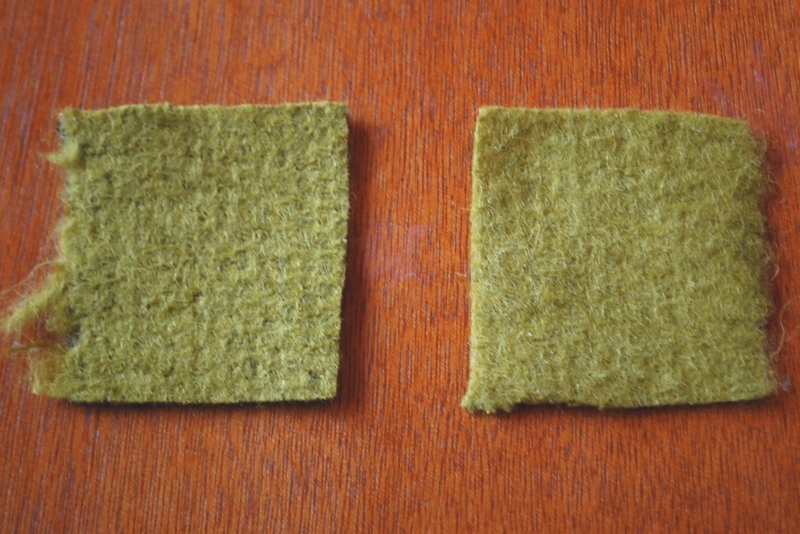 I made custom shoulder pads for the coat using the method I blogged about previously. I didn’t follow the sewing instructions for this pattern because of the collar construction Butterick used. Sewing the collar first and sandwiching it between the coat and facing would have created bulk. Also, Butterick sew the bodice and lining together, then the lower coat and lining together, then joined the bodice to the lower coat. Instead I stitched the coat attaching the under collar, stitched the lining and front facings together attaching the upper collar, and pressed the neck/collar seams open. Then I stitched the coat to the facing/lining. Two of the buttonholes are bound buttonholes and two of the buttonholes are in-seam buttonholes. The armscye seams are wrapped in fleece, creating a subtle roll in the sleeve caps. I have plenty of hand work ahead, finishing the buttonholes, tacking seams together, hemming the coat and sewing on buttons. Here’s a picture of the coat in its current state. Categories: Sewing | Tags: ensemble, Sewing | Permalink. Only hours remain before the year is done. It’s been a year of ups and downs, joy and pain. But each year is like that. I do know that this year has been filled with much more laughter than tears, and that’s a good thing. Happy New Year! I wish you all health and happiness in 2013. Categories: Sewing | Tags: moments | Permalink. Yesterday, I saw a posting by a cousin announcing the birth of his grandson. He boasted about there now being four generations of men in his family that were alive. That announcement made me think about the family tree quilt. This year my mother’s side of the family had a family reunion. I made a family tree quilt that was part of our opening night activities. I started the quilt during a week I spent in South Carolina and it was a conversation starter. Each branch of the tree is embroidered with the name of one of my great grandfather’s children. Yes, there were 15 children so this tree has 15 branches! I tried to put the branches in birth order, but that posed a problem. No one knew the birth order for two of the children who had died during their childhood. All those who might know the birth order had passed away. All that is known is that one had died falling off a wagon. Although the branches are not in the proper order, the appearance of their names on this quilt signifies that they did exist. At the reunion each member in attendance wrote their first name and birth year on a green piece of fabric. The piece of fabric was then cut into a leaf shape and tacked on the quilt on the appropriate branch of the family. It was an exciting activity! Leaves were created for members who couldn’t attend. Young teen cousins cut the precious green leaves. My elderly aunts and other cousins helped me tack the leaves to the quilt. My favorite moment was looking over and watching my first cousins with their nieces meticulously arrange their family leaves around my deceased aunt’s leaf and tack them on the branch belonging to my grandmother. This quilt has triggered so many conversations, bringing forth so much family history in hilarious stories and sad stories. I cut 200 scraps of fabric for the reunion and we ran out of leaves! It was so important to those at the reunion to create leaves for their family members who couldn’t attend or who had passed away. I will be having conversations over the next year with cousins to make sure to create a leave for each family member. Some branches on the quilt will be bare. One of my great aunts did not have any children of her own, but she helped to raise many nieces, nephews, and great nieces and great nephews. We all adored her, so her bare branch does not represents emptiness because her life was filled with love. My last remaining great aunt will be the keeper of the family tree quilt. We have so many leaves to add to the quilt and I will take time to quilt the layers together. Although I constructed the quilt by machine, I am thinking about actually doing the quilting by hand because that is the way my grandmother did it. We have a family reunion every two years and the quilt will appear at each reunion so that new leaves for the babies born since the last reunion can be added. A new family tradition! Categories: Sewing | Tags: moments, quilting, sewing for love ones | Permalink. I love spices and cardamom is one of my favorites. The aroma of cardamom is so intoxicating! One day I had a craving for cake and ice cream and made a microwave chocolate cake in a cup, throwing in a pinch of cardamom. YUM! Today I wondered what a cupcake would taste like using the same flavor profile. I sprinkled chopped pistachio nuts on frosted cupcakes. DELISH! Below is my recipe for Chocolate Cardamom Cupcakes with Chocolate Buttercream Frosting. Click here for the PDF file. The batter yields between 9 – 12 cupcakes. Preheat oven to 350°. Position oven rack to the middle of the oven. Put cupcake liners in cupcake baking pan. Sift together flours, cocoa powder, cardamom, baking soda, baking powder, and salt in a bowl. Set the flour mixture aside. Mix together buttermilk, orange juice and orange peel in a cup. Set the milk mixture aside. Beat olive oil, butter, and sugar in a large mixing bowl on medium speed for 2 minutes. Add egg and orange extract to the mixing bowl. Beat on medium speed for 2 minutes until smooth and silky looking. Add ½ of the flour mixture and ½ of the milk mixture to the mixing bowl. Beat on medium speed for 1 minute. Scrape down the sides of the bowl. Add remaining flour and milk mixtures to the mixing bowl. Beat on medium speed for ½ minute. Remove beater(s) and scrape batter from beater(s) into mixing bowl. Scrape down sides of the bowl. 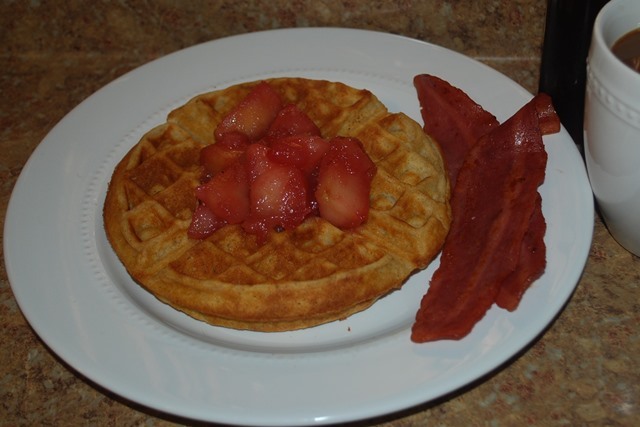 Stir batter a few times with spatula to incorporate any streaks of flour. Fill cupcake liners half full, which is a scant ¼ cup. Let cupcakes sit for about 5 minutes then remove from pan. Cool cupcakes completely before frosting them. Beat butter, olive oil and orange extract on medium speed for 1 minute. Add confectioner’s sugar, cocoa powder and orange juice. Start on low speed and beat for 1 minute until mixed well. Scrape down sides of bowl. Beat on high speed for 3 minutes until light and fluffy. Categories: Cakes | Tags: baking | Permalink. I love to see and touch my fabrics. I love to experience firsthand the colors and the hand of the fabrics, get a sense of the drape and let my mind just go until it settles on a vision of the outfit/design. A few years ago, I ordered fabric online for the first time. It was a gigantic leap for me. I am an ex-New Yorker spoiled by the abundance of independent fabric stores in Brooklyn, Manhattan and the Bronx. I settled in Maryland and I had a hard time settling for the stores and selections available here. While I appreciate my local Joann Fabric store, I like fine fabrics and that’s not why Joann exists. Deciding to give online fabric shopping a try, a whole new world opened up. I found a beautiful brocade in chartreuse yellow and beige online at Fabric Mart with coordinating wool/silk fabric in beige and in chartreuse yellow. All the fabrics were from the same designer line, so I was confident the fabrics would work together. I envisioned a brocade vest, beige pants and a chartreuse yellow ¾ length coat. I ordered beige cotton for a shirt as well. Well, when I received the fabrics I loved the brocade, but didn’t like the beige color of the wool/silk. Although the wool/silk was from the same designer line of fabrics, the brocade was more taupe (cool tone) and the beige wool/silk fabric had warm tones. My eyes and brain would not accept the pairing of these fabrics and that ended the coat, pant, vest ensemble. A year later I cut the chartreuse yellow fabric and made a sleeveless lined dress combining the bodice from Simplicity 2648 and a self-drafted gore skirt. I finished the hem of the dress with three rows of topstitching. I always wore a sweater with the dress. A few weeks ago I came across the beige fabric and decided to make a jacket. I like the combination of the beige and chartreuse yellow, and decided to make the jacket to coordinate with the dress made two years ago. Each day I worked on the jacket (Simplicity 2446) for a couple of hours letting the design of the jacket evolved as I made it. 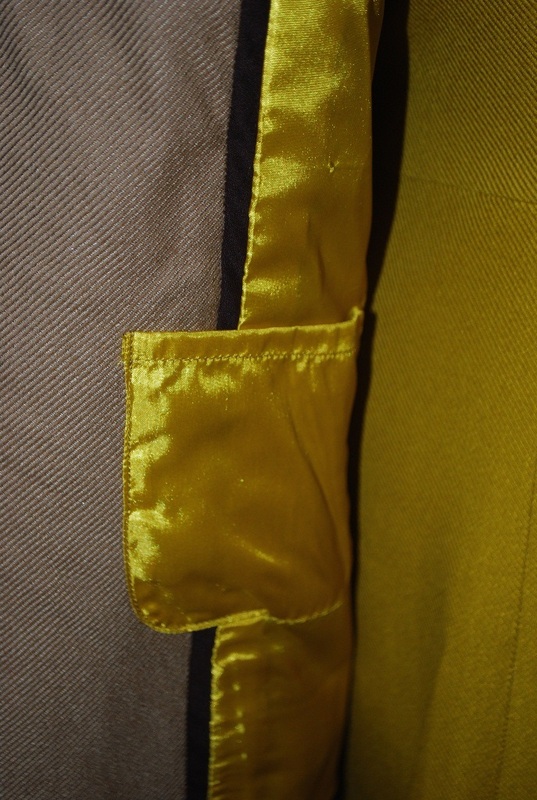 First, the under sleeves, collar and pocket flaps were cut from the chartreuse yellow. I added inside patch pockets to the lining so I could carry my cell phone with me during a meeting. 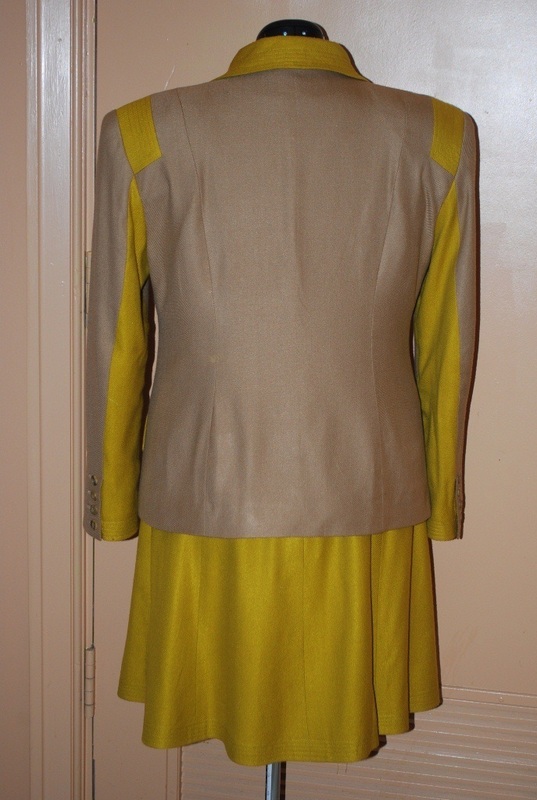 One day I got the idea to add chartreuse yellow shoulder inserts before putting the sleeves in. I didn’t want plain inserts and noticed the topstitching on the hem of the dress, so I topstitched the shoulder inserts and the pocket flaps. The next day I thought about the collar and decided to topstitch that as well. The next day, I thought about the under sleeves which were the only place on the jacket that the chartreuse yellow had not been topstitched and I knew I would not be happy leaving the under sleeves plain. 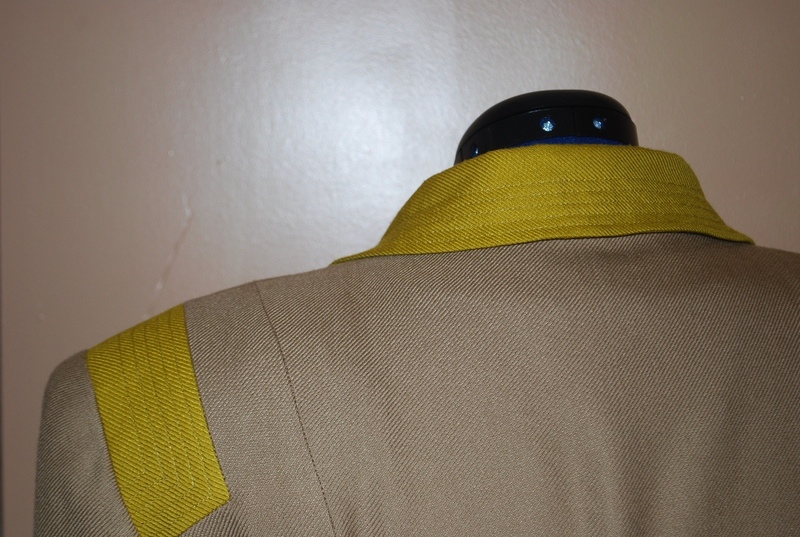 I removed the bottom button from the sleeve vents, topstitched just the under sleeve hems, and sewed the vent buttons back on. Now that I was happy with the design of the jacket, the hem of the dress haunted my thoughts. Why? I had five rows of topstitching on the jacket and only three rows on the dress hem. The stitching on the jacket was ¼” apart and the stitching on the dress hem was ⅜” apart. I couldn’t just add two more rows of topstitching to the dress; no, no, noooo. It’s the little details that bug me sometimes. I removed the middle row of topstitching on the dress and added three rows of topstitching. Now, I was happy because ALL the topstitching matched. While the colors displayed on my monitor when I ordered the fabrics did not match exactly the colors of the fabrics I received, the color combination in the brocade inspired me. I never would have combined beige with chartreuse yellow, but I like the color combination and I enjoy wearing the dress and jacket. Categories: Sewing | Tags: fabric shopping, fabrics, Sewing | Permalink.